It's official: Everyone in America gets free tacos from Taco Bell on Thursday, thanks to baseball. As expected, the fast food chain's annual "Steal a Base, Steal a Taco" free food giveaway was triggered by the first stolen base of the 2018 World Series between the Los Angeles Dodgers and the Boston Red Sox. 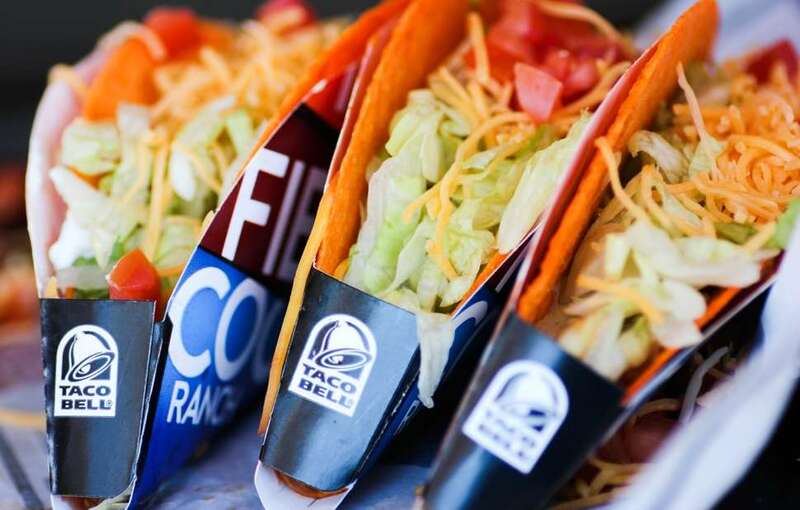 We repeat: Free tacos at Taco Bell. For everyone. Today. Sure, the Boston Red Sox ended up winning World Series, but a free taco feeding frenzy is something everyone can get excited about, regardless of team affiliation. Literally everyone is a winner, if you think about it. Taco Bell is promising a free Doritos Locos Taco to everyone in the United States. More specifically, T-Bell locations all across the country that are participating in the nationwide tacopalooza will give you one Doritos Locos Taco for literally zero money between 2pm and 6pm (local time) on Thursday, November 1. All you have to do is line up, extend your hand, take your free taco, and eat said free taco. It's that simple. Though it probably wouldn't hurt to throw some Fire Sauce on it first -- just to be safe. Why are there free tacos today? Well, the short answer is because Boston Red Sox Outfielder Mookie Betts is a "Taco Hero." In the first game of the World Series, Betts wasted no time and stole second base in the first inning, instantly triggering Taco Bell's "Steal a Base, Steal a Taco" promotion, which has rewarded America with free tacos for the first stolen base of the baseball championship for seven years in a row now. Of course, a stolen base at the World Series is basically inevitable, so the free tacos were all but guaranteed as soon as Taco Bell announced the "Steal a Base" deal would return again this year. As you may recall, Houston Astros Outfielder Cameron Maybin earned the title of America's "Taco Hero," when he stole a base in the 11th inning of Game 2 of the 2017 World Series against the Los Angeles Dodgers. In 2016, Cleveland Indians Shortstop Francisco Lindor won everyone free tacos when he stole a base in Game 1 of the World Series against the ultimately victorious Chicago Cubs. Stolen bases have resulted in free tacos every year. As for why Taco Bell is hosting the giveaway on November 1 from 2pm to 6pm, well, we're just assuming they needed some time to prepare for the hoards of hungry taco fans. 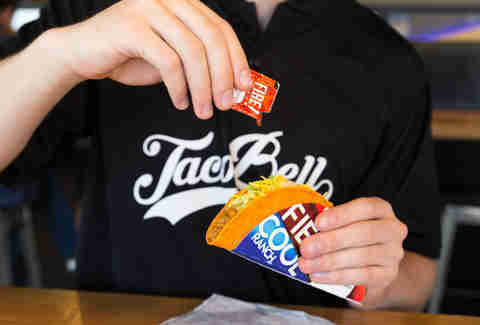 "We’ve created a fun tradition for our fans with Taco Bell and the ‘Steal a Base, Steal a Taco’ promotion," Noah Garden, MLB executive vice president, commerce, said in a statement. "It makes for a unique moment every year during the World Series and certainly the fans will have their eyes on the first stolen base of the Fall Classic." In case you’re wondering, Taco Bell has a limit of one free Doritos Locos Taco per person, while supplies of the beloved nacho cheese-flavored taco shells last. The company won’t reveal how many free tacos will be available at any given restaurant or how many tacos it expects to hand out in the four-hour period, but judging by the popularity of the giveaway in previous years, it will be a lot. It’s estimated that Taco Bell gave away $10 million worth of free tacos after the 2015 World Series, according to a report by Business Insider. With that said, it would behoove you to get in line at your neighborhood ‘Bell a little early if you can. In addition to the free tacos, Taco Bell is teaming up with Topps, the trading card company, to create limited edition “Taco Hero” baseball cards for the 2018 World Series. The cards are now available at the chain's locations near the ballparks hosting the World Series in Los Angeles and Boston and with any purchase of a "Steal a Base, Steal a Taco" baseball caps, which are new this year at Taco Bell's Taco Shop. The pack will include all six previous Taco Heroes: Cameron Maybin, Jacoby Ellsbury, Jason Bartlett, Ángel Pagán, Lorenzo Cain, and Francisco Lindor. The seventh, Betts, was made available at Topps.com 24 hours after the base is stolen. Getting cards of people who won free tacos for you is a, uh, unique way to show your appreciation, but it’s something. The bottom line: a free taco is a free taco. Go get it. And don't miss out on all the other free food you can get this month. Tony Merevick is Senior News Editor at Thrillist and sadly won't have enough time on Thursday to go out and get one. Send news tips to news@thrillist.com and follow him on Twitter @tonymerevick.